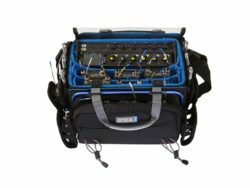 The K-Tek Stingray MixPro Bag is designed for the Sound Devices MixPre-3 and MixPre-6. It also fits the Tascam DR-70D, DR-701D and the Zoom F4, F8 & F8N. More than an ordinary bag, the Stingray MixPro can help turn a small recorder into a portable workstation.